I first blogged about Edins in Broad Street back in June 2013 when I described my experience as ‘a quite delightful light lunch’. I had just had a simple meal of ‘Ham Hock & Tarragon Pasta Shells with a Dijon Mustard Sauce‘ as part of a lunchtime deal that also included a bowl of ‘Leek and Potato Soup’ both for just £4.95. Looking back now, that was such a good deal! That visit had inspired me at the time to recommend Edins in the ‘Meals for under £10’ in an article I wrote for Olive Magazine (Feb 2014 edition). It seems a long time back now but you know what I have still been telling people it was great value and a great spot to get really good food without fuss and pretention since. So I was surprised when I walked down Broad Street a few weeks back to see the place closed up, I was worried, but then somewhat relieved, when I learned that they were just closed for a brief moment whilst they expanded into the space next door formerly occupied by Lee Rosie. This place is on one of my regular strolls through town so I kept an eye on the place as I waited for signs of life and for it to reopen. Two weeks ago, I was walking past one Friday and the door was flung back open, and I could still smell the paint as I wandered in to see what was occurring. That first night they were ‘in their own words‘ just doing a “Menu Del Dia” while they got up and running again so that they could ‘just get the doors open’ and try a few things out on the menu and see how it went. I mean fair enough if it’s tasty and popular, but I did kind of like the sort of food that they served up before. I was happy enough though to get something to eat, I mean if the bloke at the door asks you if you are hungry and want to order some food, it is basically a question requiring the simple answer of yes. Well I think he spoke to me and it was not really a subliminal thought posted to my brain. I took a seat outside in the knowledge that I was the first diner to eat and ordered a couple of safe dishes that I really quite fancied. This dish is deceptively simple yet full of favour, there is a lot of sweetness from the chopped fresh tomatoes, a lovely flavour from the mix of garlic, salt, olive oil and fresh herbs. Traditionally I understand that this dish also uses chopped up sautéed aubergine and it may well have done as I thought it had chunks of softly cooked onion, but the flavour was so light that it could have been and probably was eggplant. I liked this dish, full of garlic and loads of juicy mushrooms, I am not sure that I picked the best dishes to go with these, and to be honest the best thing they could go with is a big juicy steak and that wasn’t on the menu 🙂 Maybe ? A couple of weeks later I came back to eat, In the interim I had been popping in to see if they had expanded the menu, but it seems that they are still sticking to the Menu Del Dia and just adding more dishes to it, so I just decided I was hungry and sat down to try some more of their offerings. The sweet garlic butter sauce was really good, mixed with olive oil it was dripping all over the place. The very crispy slices of garlic that were floating in it and on the prawn added another hit of powerful garlic if you chose to eat them and the lemon was needed to add a little citric spark. I was also very much in love with the saffron mayo that came along with the shrimp, it was creamy and delicate and a little bit decadent. This was probably a dish for one person as I think that it would be pretty hard to share this one easily tapas style. The next dish was Huevos, Patata y Chorizo which is basically broken or ‘scrambled’ eggs mixed with fried potato and chorizo sausage. This is one seriously yummy dish and even though I was having this as part of my evening meal, I would have been just as happy if this was my breakfast. It really is very tasty, the scrambled eggs are soft. light and creamy, the juice from the chorizo sausage mixes in with everything adding a lovely bit of savoury, sweet and saltiness. I love this sausage meat anyway so any dish with it in I am going to be all over. I am most certainly adding this dish to my list that I have to pick when I come here again. The next dish to arrive was the Albondigos, or Spanish meatballs in a thick garlic, tomato, and herb sauce. 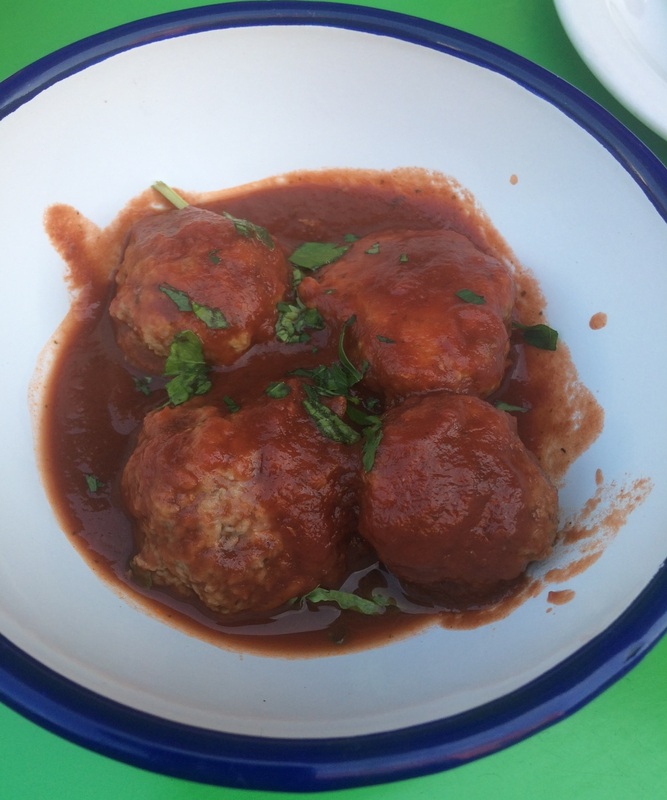 I do really love a good meat ball and these Spanish ones did not disappoint they were a pretty tasty spherical treat. These were reasonably solid but they were still soft and juicy, the softness I suspect is from the traditional addition of bread to the blend of ground pork and ground beef that soaks up the meat juices. The sauce was a bit thicker, browner, sweeter and perhaps less tomato than I had expected. The sauce is traditionally made of tomato, garlic, olive oil, paprika, cayenne and thyme and many of those flavours were coming through. There was a little bit of sweetness that typically comes from the addition of honey to the sauce. I wasn’t in the kitchen though so I am pretty much guessing all of that 😊. I did find a few recipes online and I might try and replicate at home to see if I can mimic these. Even though I am quite enjoying this Menu del Dia that they have been offering lately. I am still yearning for or looking forwards to the sort of menu that they used to serve. It is located at 15 Broad Street in Hockley, NG1 3AJ if you are typing the location into your phone.